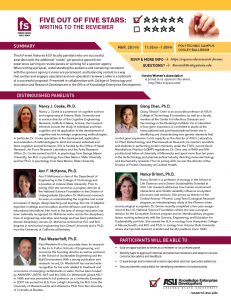 Learn from ASU faculty panelists who are successful awardees with the additional “inside” perspective gained from experience serving on review panels or working for a sponsor agency. When writing a proposal, understanding the audience and remaining consistent with the sponsor agency’s vision are paramount, and balancing content in a way that excites and engages specialist and non-specialist reviewers alike is a hallmark of a successful proposal. Register online — Attendance is limited. Sign in at the upper, right corner and the registration form will appear at the bottom of the page. Source opportunities to serve as a reviewer or on a review panel. Identify ways to approach internal and external reviewers and steps to receive constructive advice and feedback. Create design and content directed to specialist and non specialist audiences. Discuss benefits and pitfalls for identifying reviewers on submissions. Each of four panelists will give a 10-minute talk followed by general Q&A. Assistant and associate professors are encouraged to attend, but the target audience is faculty applying for funding from federal agencies. identifying and characterizing new genetic elements that control gene expression. 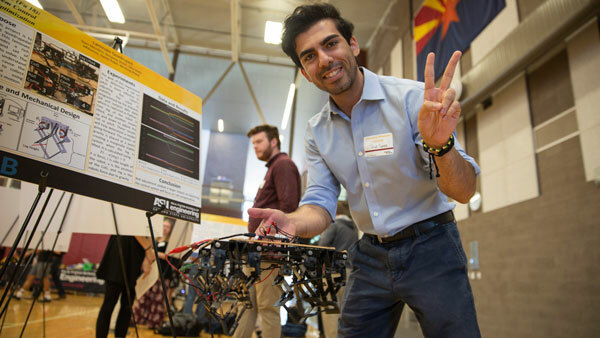 In his capacity as the director of ASU’s Laboratory for Plant Biotechnology and Pharmaceutical Research, he mentors scientists and students in performing protein chemistry under the FDA’s current Good Manufacture Practice (cGMP) regulations. Chen was a PMGI and NIH postdoctoral fellow at University of Minnesota and spent more than ten years in the biotechnology and pharmaceutical industry directing molecular biology and biochemistry research. Prior to joining ASU, he was the director of the Division of Protein Chemistry at Cardinal Health. interactions and climate variability influence ecosystem processes and services. She serves as director of the Central Arizona — Phoenix Long-Term Ecological Research program, an interdisciplinary study of the Phoenix urban socioecological ecosystem. Grimm recently completed a two-year assignment at the U.S. National Science Foundation, where she was a program director for the Ecosystem Science program and an interdisciplinary program liaison working extensively with the Science, Engineering, and Education for Sustainability portfolio. She earned her B.A. in ecology from Hampshire College in Massachusetts and M.S. 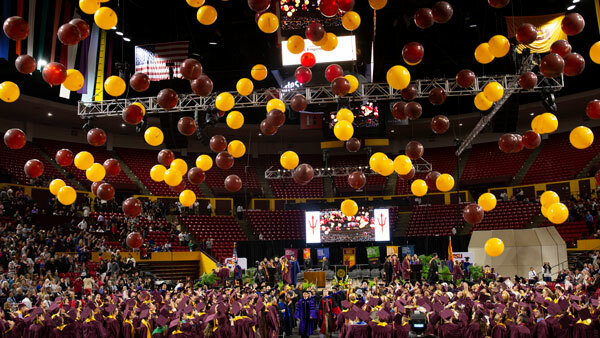 and Ph.D. in zoology from Arizona State University where she has held research scientist and faculty positions since 1990.
team cognition and performance. She is funded by the Office of Naval Research, Air Force Research Laboratory and the Army Research Office. Cooke earned her B.A. in psychology from George Mason University, her M.A. in psychology from New Mexico State University and her Ph.D. in psychology from New Mexico State University. educational innovations. Her work in the area of design education has been nationally recognized. McKenna works across the disciplinary lines of engineering, education and design and has been published in diverse disciplinary venues. McKenna received her B.S. and M.S. degrees in mechanical engineering from Drexel University and a Ph.D. from the University of California at Berkeley. in 1995 and was promoted to full professor as a University Exemplar in 2007. He earned his B.S. from Lehigh University, his M.S. from the University of Massachusetts and obtained a Ph.D from the University of Colorado at Boulder. Learn more the Research Strategy Group’s Research Forums. Presented in collaboration with College of Technology and Innovation and Research Development in the Office of Knowledge Enterprise Development. Faculty Women’s Association is proud to co-sponsor this event.